Combine egg, mayonnaise, green onions, parsley, seasoning mix, mustard, and hot sauce in medium bowl. Fold crab gently into mixture. Cut a 15-inch-long piece of aluminum foil and place on counter. Spread crab mixture in a line near one long end of the foil. Wrap foil over the top of the crab and continue to roll, forming a log about 10 inches long. Twist ends of the foil to tightly flatten log ends. Freeze 30 minutes. Melt butter in a small microwave safe bowl; set aside. Place bread crumbs in a small shallow bowl; set aside. Remove crab log from freezer. With aluminum foil intact, cut log into 1-inch-thick slices using a serrated knife. Place slices on a pan that will fit in freezer; freeze 15 minutes. Preheat Presto® Electric Griddle at 350°. Remove crab slices from freezer. Keeping aluminum foil intact, dip each crab slice into melted butter and then into bread crumbs. Repeat on the other side. Place slices on griddle. Tent the griddle with a piece of aluminum foil. Cook 6 minutes or until golden brown. Turn crab slices, tent the griddle and cook 6 more minutes or until golden brown. 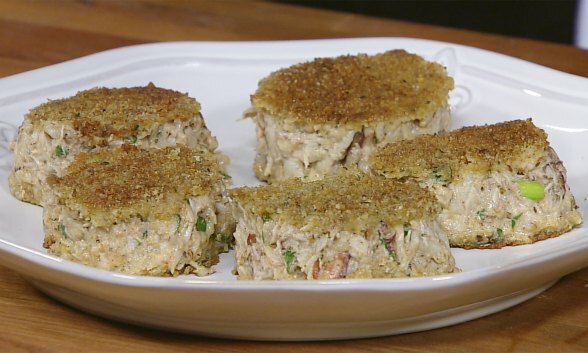 Remove crab cakes to a platter. Remove aluminum foil before serving. Serve with sauce of choice. Watch Chef Kevin Belton prepare Light and Tasty Crab Cakes in this video. *Such as Old Bay® seasoning mix.